Here’s a simple DIY project that you can complete in less than 10 minutes. That’s right 10 minutes and under $10 bucks! Last week I was in the grocery store staring at this huge pallet of pumpkins. Surprisingly they caught my eye since I never really got into the whole pumpkin carving tradition. Perhaps because they seem to spoil so quickly once being cut into. I’ve seen where people decorate with puffy stickers and various other characters but that didn’t fit my style. That’s when an idea popped into my head. A hashtag pumpkin. That’s it! I’ll create a hashtag pumpkin only I’ll substitute the knife with a paintbrush. I ran to Michaels to pick up some paintbrushes and black acrylic paint. Grabbed a 5×7 piece of white paper from the recycle bin and I was all set. After gathering the supplies, I’ve listed in the image above, here’s what you do next. Wipe off the pumpkin with a damp paper towel to remove any dirt. Squeeze a nice amount of paint onto the piece of paper. Depending on how many pumpkins you’re creating will determine how much you need. Using the paintbrush, practice your hashtag on the paper first. This step is not necessary but I found it helpful in deciding which paint brush to use. Then simply apply the hashtag to the pumpkin. Allow the paint to dry and you’re done! You can also turn the pumpkin around and paint another hashtag on the backside. Total cost for this project was approximately $8.85. The pumpkin was @2.99, paint .89 cents, brushes 2., and the various gourds were .99 cents each. Over the next couple of months I’ll be sharing some tips and ideas with you that I use in my own flower garden(s). I can show you that with a little imagination and a few bucks your flower beds will look awesome. Who doesn’t love a fun DIY project? Especially when it involves being outside in the fresh air. First up, hosta plants. I love hostas! The simple fact that they’re low maintenance is all I need to hear. Plus, when they outgrow their space you can just chop them in half (or fourths) and plant elsewhere. I had this little area of grass in front of my garage. It was a nuisance to mow so it was given a new look. My neighbor was selling hostas at her garage sale for $1. Score! My parents decided to update their landscaping and no longer needed the lava rocks they were using. Another score! I wait until the end of Winter (when all of the snow melts) before trimming the dead leaves off of the plants. And that’s it. Mother Nature takes care of the rest. As you can see in the image below the hostas are doing well. Exceptionally well! There are four plants total in this space, but one of them is hidden so I should relocate that one. Come Fall, the other three will be divided up and placed in other areas around the house. Have you ever thought of placing confetti inside of the greeting cards you gift to others? Sounds crazy right? An ex of mine (yes, I’m giving him credit) use to give me cards that had confetti inside. When I opened them up a handful of hearts would fall into my lap. They were those shiny sequence ones you can buy at the store in the party section. Why spend money on something you can make at home for less. And it’s a great way to use up any paper scraps you have lying around. Gather your choice of paper and a heart shaped Fiskars punch. Punch out the desired amount. Personalize your card with a message and then place the confetti along the crease of the card. When you go to put the card inside of the envelope do so with the folded side first. That way the confetti won’t fall out inside of the envelope when the recipient removes it. This easy tutorial not only works great for your Valentines Day cards, but for any occasion. Birthday celebrations, New Babies, Congrats, Just Because, etc. Be creative and use various shaped punches. Do you recycle your magazines after you’re done reading them? Keep one on hand. It’ll make some colorful shiny confetti. Remember the last time you got a package ready to ship in the mail? After your done filling the box there’s a few gaps. What do you do? Grab some packing peanuts, bubble wrap, or maybe some crumpled up newspaper. It all works. How about using fruit flavored snacks? They come individually wrapped and will fill those little gaps perfectly. I came up with this idea awhile ago as I was getting a box ready to ship to my niece and nephews who live out west. An inexpensive little addition to the package that they love. The kids are HUGE fans of Star Wars and Curious George, so these were perfect. Do you have any other ideas for alternative packing materials? Please share in the comment section below. Thanks! What day is it? Where am I suppose to be today? I always find myself asking these questions as another holiday passes. I actually had to write down my schedule for Friday on a piece of paper so that I wouldn’t forget. Perhaps it’s a sign of old age. I guess you could call it a Holiday hangover (without the alcohol). Have a great weekend! According to the weather man it’s going to be a hot one here in the Midwest. A frame used as a dessert tray. My nephew would LOVE this all of these. Raspberry lemonade yogurt ice pops. Postcard sugar cookies. How cute are these? The 10 habits of highly organized people. DIY styrofoam Polaroid frame. Awesome! I look at my yard as an extension of my house. Complete with all the comforts on what’s inside. Here’s a simple DIY project I put together in less than 10 minutes. Along with the comfort comes the maintenance. Adam purchased a brand new grill last week. I wanted to come up with an idea to not have to move it off the lawn every time the grass was cut. It was such a hassle to do last year. I love patio bricks. All the creative shapes and colors. I went for the simple look here. Picked out twelve of them and placed them in a square. They were laid in the grass right after I mowed it. If you want you could remove some of it to help them settle into the ground a little more. I figure over the years they’ll do just that along with help from the weight of the grill. I left enough space that the lawn mower can move comfortably around each side. And it works like a charm. Pretty easy! And it costs less than $25. I’ve been on a recycling kick lately. Perhaps it comes from all the unfinished projects I’m finding in my garage. Have fun with the list! We’ve all seen those big, bulky entertainment centers at the thrift stores or on the side of the road with a huge FREE sign attached to them. Pick one up and create this. Organize your craft ribbon using cans. Vintage suitcases are very popular in my Mom’s shop. I came across this article with tons of inspiration. Before you throw away any furniture check and see if you can transform the pieces into something for the herb/flower garden. Using Mod Podge, patterned paper, and a few other oddities you can make these unique little tins. Business card holder, sewing kits, small gift boxes, etc. Their uses are endless. Drink a lot of wine? Reuse those corks! Skip the jewelry box and go for one of these! Recycle those oddities that you have around the house tucked away in a box. Alphabet block magnets. Good idea. If I owned my own Bed & Breakfast I would create a different theme for each room. Here’s some ideas for repurposed headboards. Garden tool table and chairs? Love this idea! 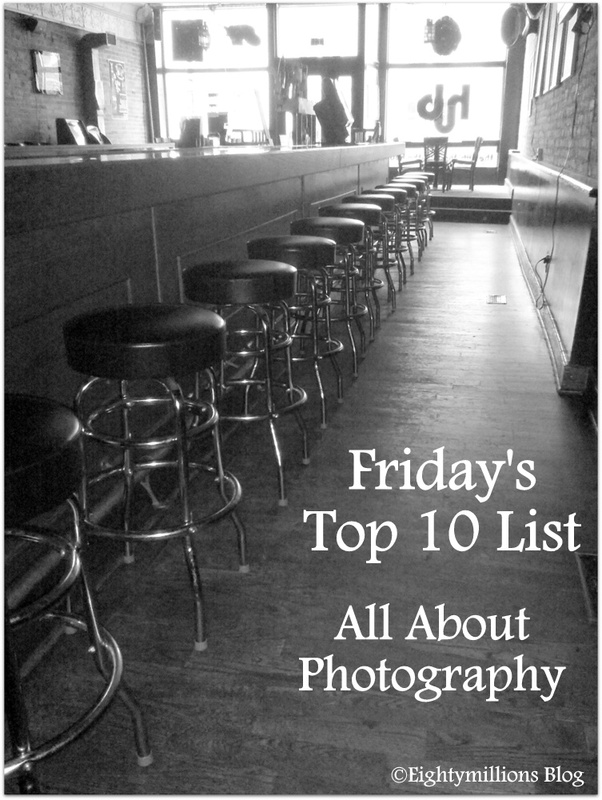 I’ve been on a photography kick lately so I decided to do another list on that very subject. Have you heard of Lomography.com? I finally registered with their website last month. Great tips and cool cameras. Last night I got an email stating that my “piggies” are going to expire within the next couple of days. Not knowing what this was I did a little investigating. I accumulated credit that I could use in their shop. Piggies equal dollars so I purchased some black & white film and a Diana lens for my Nikon. If you love the artsy side of photography then you’ll love their website. I hear that May is a good month for selling your house. Here’s some tips to shoot a great house tour. Have you ever bought something and then it just sits in the box? I have a Bamboo Tablet, brand new and never used. I bought it for the sole purpose of doing this. I should try it someday. Are you a food blogger? I’ve ate a lot of cold dishes as I was working on getting that perfect shot. Here’s a post to help you photograph your food so that it looks as good as it tastes. Brittni, from Paper & Stitch shared a three part series filled with awesome photography resources. Here’s part one, two, and three. Jim Harmer started his website out of his love of Photography. He shares advise on camera gear, podcast, online classes, flash photography, landscape tips, and I could go on and on. Go check out ImprovePhotography.com. Be careful, you might get lost. I have this book and I love it! 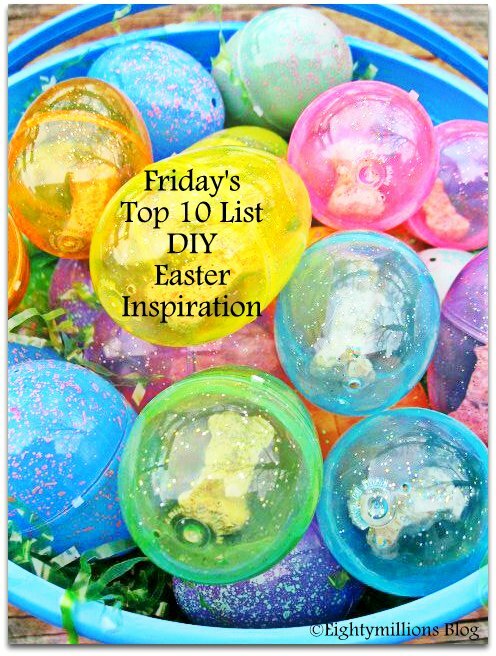 Lots of cool DIY projects and inspiration. The best cheat sheet for photographers. Especially those that are just learning how to use a DSLR. Yes, that’s me! I get a little nervous when it comes to street photography. I don’t want to offend anyone, yet I want to capture that unexpected image. Here’s an article, from Stacey via the CM Blog, that I found most helpful. Alisha Robertson shares her insight and knowledge on photographing newborns in a two part series on MCP Actions Blog. Here’s part one and part two. This week I’ve been trying to focus on things that make me happy. There is just too much evil in the world. If your reading from the Boston/Texas area my thoughts and prayers are with you. What makes you happy in times of tragedy? I think of my garden. I’m looking forward to spending some time outside getting my projects in order. Last week I shared a list of Spring themed ideas for photo props, napkin rings, and watering cans. If you missed it click here. This week I decided to keep the Spring Inspiration coming. This time focusing on the garden (food and flowers). So many projects with so little time. It always amazes me on how creative people are. More thankful that they share their ideas. Recycle an old pair of work boots, a birdcage, or a stove in your garden. Recycle those old tires into container gardens. LOVE this idea and I have an extra tire laying around. I use these blocks for flower pots, but here’s another great idea. Do you have an extra bird cage sitting around? Try this. Recycle those egg shells and toilet paper rolls. I love the title of this post. The Top 10 List is back! And this week it’s all about Easter. I’ve been coming across a lot of adorable DIY projects relating to the holiday, so I collected my favorites to share with you. Enjoy! Notice the eggs in the photo above? Yes, they are filled with dog bones. We had an egg hunt for the boys a couple of years ago. The yard is full of mud so perhaps this year we’ll have one inside for them. Melissa, from Bubby and Bean, shares 10 ways to decorate your eggs. This is interesting. You’ve been egged! A simple vase for your table setting. Here’s a free download for a peeps label. Good idea for gift giving. A cute little skirt made from dishtowels. Make a bird’s nest for your eggs.